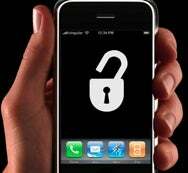 Five months after the release of the iPhone 3G last July, a team of hackers has finally figured out a way to alter the device’s software so that it can be unlocked for use on networks other than AT&T’s. That team is, of course, the infamous iPhone Dev-Team, most recently seen hacking the iPhone to run Linux. The unlocking hack isn’t out yet, but the team plans to release it on December 31st; it will require that your iPhone 3G be running version 2.11.07 or earlier baseband (the software that controls the cell phone part of the iPhone) and already be jailbroken. The Dev-Team also plans to release the hack as a standalone software program that can be run by most end users. Hackers and Apple waged war over iPhone unlocking when the original model was released in 2007, with Apple repeatedly throwing up additional obstacles with subsequent software updates. Indeed, there’s little reason to think that we won’t see a repeat performance this time around. It’s anybody’s guess how long before Apple releases its next software update, but if last year was any indication, the hackers will continue to find ways around Apple’s blocks. Of course, those willing to spend a little extra money can always try and import a legitimately unlocked phone from the likes of Taiwan.